The club aims to compete at major domestic heads and regattas, as well as supporting local events. Crews attaining a sufficiently high standard will be entered for the premier domestic competitions: Henley Royal Regatta, Women's Henley, the National Masters Championships and Henley Masters Regatta. With a little practice and coaching, even relative beginners can experience the thrill of the race. The links to the leftlabelled Wins by Year, below, will lead you to records of the club's successes in recent years. We keep a tally of wins at regattas by club members. In 2018 Tom Bishop won the club the highest number of pots - 16. There is also regular competition within the club throughout the year for those keen on single sculling. See the Sculling page for further details. You can also access a record of all Quintin crews in the Head of the River Race from the first race in 1926 to the present day. 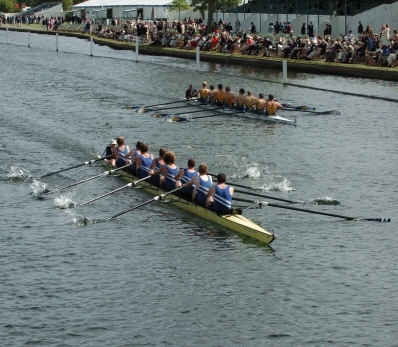 Quintin competed in the Thames Cup. You can also access a record of all Quintin entries at Henley Royal Regatta from the club's first accepted entry in 1920 to the present day.